"I dont like egotistical people; I dont like huge egos out of control, all that being treated as someone special with your huge entourages being whisked off to VIP rooms type of thing. I find that attitude a real turn off. Thats why I dont do much press, because I dont like talking about myself all the time." Chatting down the line from his London studio Pet Shop Boy producer Chris Lowe, is surprisingly (and thankfully) extremely chatty despite his well-known dislike of publicity and being recognised. Hes also remarkably down to Earth, particularly given that with his PSB partner Neil Tennant he belongs to Britains most successful pop duo of all time. Not that hed see it that way, in terms of fame, money or even whether hes a pop star, at least in the usual sense of the term. "Ive never sought fame or public recognition. I think one of the qualities many pop stars have, which is why they are what they are, is because they have huge egos, whereas Im actually against the whole concept of ego," he explains. "Everything I do tends to be contradictory." One thing hes less contradictory about his music, which remains an abiding passion some 20 years into his career. Ive always loved going in the studio, having fun and seeing what comes out of it. Were always working though I would probably like to work less but Neil likes to be busy all the time, Im a lazy git, and Id be quite happy to disappear for two years to go trekking but our diaries are always pretty full," says Chris. "I think thats a good thing really, because otherwise you just disappear. When you stop or go away its so easy to lose touch with whats going on in England, even if you go away for a three week holiday youve lost the plot. I dont know how these superstar DJs manage to travel around the world and still keep in touch with whats happening. I think its good to keep on top of it all." Skrufff (Jonty Skrufff): You recently released another PSBs Greatest Hits album as well as your current single Flamboyant, do you feel like you starting a new phase of the Pet Shop Boys? 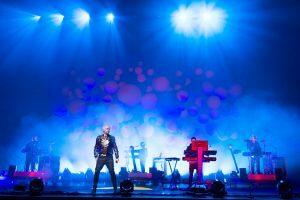 Pet Shop Boys: "Whats different about now is that weve really been inspired by the electroclash scene, its rejuvenated our interest in clubbing again. House music lasted a very long time (laughing) and I was always a huge fan but I think we were ready for something new to come along. I cant deny the electroclash scene has been an influence on Flamboyant for example. The other factor is that now you can get all these virtual analogue keyboards that we used to use in the 80s. You can now get them as plug-ins so thats also given us a whole new impetus, weve been able to access all these great old sounds that we used to use and do more with them in the computer. Those two factors have come together for us to start producing more electronic sounding music again." Skrufff: George Michael was talking recently of a dreadful creative block he had, saying he was worried he couldnt write anymore, do you ever go through that kind of emotion? Pet Shop Boys: "Hes never been very prolific, has he? I imagine that almost every song hes written is on an album, whereas with us you often get an albums worth of songs with each single. Weve never had creative blocks, Ive always loved going in the studio, having fun and seeing what comes out of it. No doubt that could happen at some point. All songwriters are supposed to have a ten year period of writing good stuff then after that its all over, though were 18 years in." Skrufff: Youve had number one hits throughout your career, what criteria do you judge success by these days, are you judging by chart positions? Pet Shop Boys: "Charts are a different side of success. There are two elements, the success of the record creatively, ie whether the record has an emotional impact on the listener then theres the chart thing. Both Neil and I would still love to be at the top end of the charts all the time and we still manage that, Miracles was top 10 but were doing it these days without mass media coverage, which is actually quite a struggle. Englands quite a strange place in the sense that the media will suddenly decide theyve had enough of you and move on whereas in other countries its different. Thats a fair enough attitude if the artist has lost it or has stopped making good music but I think were still producing good music personally." Skrufff: DJ Hells recently remixed West End Girls, how do you feel about other producers reworking your version, do you feel in any way competitive? Pet Shop Boys: "Oh no, I get totally excited by it. We almost always choose the remixers and I find it very exciting to hear how someone else interprets your song and giving it a more clubby feel. I think DJ Hells mix is great, hes done it really punky and all the sounds are very dry. I think its quite shocking." Skrufff: Is Hell someone you know personally? Pet Shop Boys: "Ive only met him very briefly in the DJ booth at Nag, Nag, Nag last year. I remember reading about some famous party he had in Barcelona. He also designed a special label for West End Girls. I really like the whole aesthetic of Gigolo Records." Skrufff: Do you know electroclash-man Larry Tee in New York, hes just opened a new club at Pyramid, on Avenue A? Pet Shop Boys: "Pyramids back? Thats good because I thought clubbing was over in New York. I cant believe what theyve done to New York nightlife in the last few years though Im sure well follow suit here in England. I hope if they do try and bring those rules in over here, that theres some sort of uprising." Skrufff: What do you make of the puritan anti-club culture attitude prevalent in the States currently? Pet Shop Boys: "I just dont understand it at all. New York advertises itself as a 24 hour vibrant city but when you remove that night-time element from it, theres not a lot left; its just a boring city with tall buildings. Its a lot safer admittedly. I remember being near the Port Authority Bus Terminal in the mid 80s and it was terrifying. There was a very interesting club there, actually in the Port Authority Bus Terminal. Though Im actually in favour of the no smoking ban (bursting with laughter). Im a massive contradiction. You just cherry pick the bits you like but I do like going to a club and not stinking (of tobacco) when I get home. I think there should be smoking areas in clubs, thatd be a good compromise. Another outcome of all these rules could be to make the scene more underground again, the beginning of the rave scene, for example, was totally illegal and it was fantastic. I loved all of that." Skrufff: Were you going raving through all the Shroom days of the late 80s? Pet Shop Boys: "Yes. Though what I really liked doing was driving up to places like Walthamstow (North-East London) looking for raves and seeing a lad standing by the road, with an arrow, saying this way. I used to love all those raves and warehouse parties. I remember touring round the UK at the time when the rave scene hadnt spread outside London and Manchester and being shocked at seeing people still going to old fashioned clubs." Skrufff: You grew up in Blackpool, a northern party city with quite a tough reputation . Pet Shop Boys: "Blackpool certainly can be quite a violent place though I think Blackpool, and actually every town centre in England, is more violent now than it was in my day, though maybe thats because Ive turned into a soft southerner. When you go outside London, you do think Gor blimey, how scary is this? I went to watch Arsenal in the FA Cup Final in Cardiff, for example, and, my God, Cardiff on a Saturday night, Wow! Its got an incredible air of violence and aggression that I dont remember when I was younger." Skrufff: Were you born in Blackpool? Pet Shop Boys: "I was born there and grew up near the Pleasure Beach (Blackpools rollercoaster theme park). The Pleasure Beach was literally at the end of my road so it was great to hear the noise of the rollercoaster. The good thing about growing up in Blackpool was that you spent all your time hanging round amusement arcades. I also used to go to a club called Man Fridays which had plastic palm trees, during the disco era, and I did odd jobs as a glass collector. I remember seeing a horrible fight once on Central Pier, when this lad was getting his head kicked in by about a dozen other lads, it was such a horrible sight. One of the things I always liked about the rave scene was that it wasnt about violence; it was about love and that was a huge change. Because people forget nowadays that the only time that men ever went on the dance floor before the rave scene was at the end of an evening, to chat up a girl. Men never used to dance; theyd stand round the edge of the dance floor while the girls danced around their handbags. Lots of people wont remember that far back." Skrufff: You were in London during the New Romantic era of 1981/ 82 when people like Boy George and Steve Strange were all over the club scene, were you also going out on that scene? Pet Shop Boys: "Me and Neil were there but we werent really part of it, we were more like observers on the periphery. I found that whole New Romantic era so exciting, Ive always loved people dressing up and being flamboyant and going against the norm, but Im just not one of those people who does it. Even though I admire it so much in other people." Skrufff: Were you ever tempted to try it out? Pet Shop Boys: "No, I wasnt tempted at all, the only time Ive ever dressed up is as a Pet Shop Boy. Everything I do tends to be contradictory. My favourite fashion clothes during the new romantic days were casual. I loved the casuals, and loved having a Fioruccci top and Tacchini jeans and even now I still like Stone Island. Ive never been into wearing make-up either, its just not me, but Ive always liked going to those clubs where people do. I went to the opening night of the Camden Palace in 1982, Steve Stranges night, and went there wearing a sweat shirt and a pair of jeans; I dont know how I got in. There were people dressed in amazing costumes being turned away but for some reason they let me in." Skrufff: I read in on old Guinness Book of Rock Stars that you were dropped by CBS in 1984 when West End Girls was first released, after it failed to chart. . .
Pet Shop Boys: "We werent dropped, what happened was, we had a one single deal." Skrufff: Did you lose faith at all when the song failed to make the charts the first time round? Pet Shop Boys: "No, because although it got a little play on Radio 1it amazingly got a huge amount of play on K Roc in Los Angeles and was their screamer of the year, in other words, their biggest record of the year, and had a huge impact so we still thought the song had something. So then when we signed to Parlophone we went on to re-record it. You never know when youre going to have success. When you havent had any success, you cant imagine ever having it, because you cant imagine that the radio stations will ever play your records. So when it does happen, its amazing." Skrufff: How easy was it to avoid going off the rails, when you achieved number one hits? Pet Shop Boys: "We were both quite old when we started, Id already finished six years of university, so we werent young, though I dont know if that makes you more sensible or not. Im not such an excessive kind of person anyway, I dont have an addictive personality, my brain and my body have real cut-off points, which says go to bed. I know people whove had problems and they dont seem to have that cut-off point, they go out on a Friday and theyre still out on Monday afternoon. I like sleeping too much, I love going to bed. I think thats a real safety valve." Skrufff: Some pop stars talk of fame and worldwide success as being hollow when they get it, whereas you seem quite fulfilled by the whole thing, has money brought you happiness? Pet Shop Boys: "Money? Money doesnt bring you happiness though its nice not to have to worry about it too much, which isnt the same thing as happiness. That sounds terrible to someone whos sleeping on the streets. Happiness is a very complicated issue and its not simply related to money. Ive never sought fame or public recognition. I think one of the qualities many pop stars have, which is why they are what they are, is because they have huge egos. Im actually against the whole concept of ego, I dont like egotistical people, I dont like huge egos out of control, being treated as special with your huge entourages being whisked to VIP rooms. I find that attitude a real turn off. Thats why I dont do much press, because I dont like talking about me all the time. When you think about those huge rock stars with their huge egos, if thats the only thing thats driving them, then maybe thats why theyre not fulfilled ultimately." Skrufff: Do you feel a sense of drive to keep on going long term with the Pet Shop Boys? Pet Shop Boys: "God yeah, were really driven, we love doing what we do and we love writing songs. Were into it, we still watch Pop World on a Sunday." Skrufff: Any relationship is difficult to maintain for 20 years, how easy has it been to maintain your relationship with Neil? Pet Shop Boys: "Ive not really thought about it, we get on. Neils really funny and good company and we have the same interests. I think the main thing is that we enjoy working together. I read something about Michael Stipe saying REM could only function if they spend a lot of time apart and I thought well, why bother?"
Pet Shop Boys Flamboyant is out now on Parlophone (as is their latest Greatest Hits compilation PopArt: The Hits.